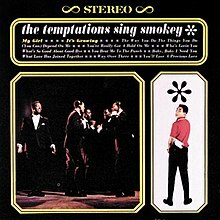 The Temptations Sing Smokey is the second studio album by The Temptations for the Motown label, released on the Gordy Records subsidiary (G 912) in 1965. As its name implies, it is composed entirely of songs written and produced by Smokey Robinson, and several other members of the Miracles as well. Several of the songs are covers of songs Robinson produced for the Miracles or Mary Wells, while the rest were originally recorded by The Temptations. Among these are three successful hit singles, starting with "The Way You Do the Things You Do", which featured Eddie Kendricks on lead vocals. The next two songs feature lead vocals by new Temptation David Ruffin – "It's Growing" and the group's signature song, "My Girl". Not included are two singles which predate these two singles, "I'll Be in Trouble" and "Girl (Why You Wanna Make Me Blue)" (whose b-side, "Baby, Baby I Need You", is here). These songs would be included on the next Temptations album, The Temptin' Temptations. A third hit single, "The Way You Do the Things You Do", is present here, although it was also issued on the previous Temptations album, Meet the Temptations. Both these songs have subsequently been released. "Baby, Baby I Need You"
B-side – "What Love Has Joined Together"
"You'll Lose a Precious Love"
Note – There was no Billboard R&B singles chart from November 1963 until January 1965. Most discographies include R&B information from Cash Box magazine to fill in the gap in the R&B chart, as is done here with the 1964 releases. This page was last edited on 12 March 2019, at 18:19 (UTC).